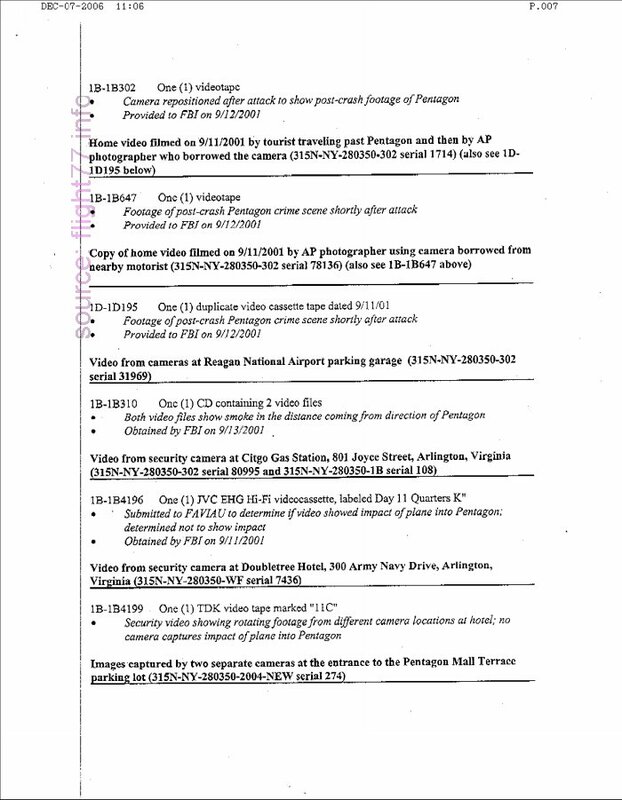 By all accounts, there were about 85 video surveillance cameras in the vicinity of the Pentagon that might have captured some part of the Pentagon event. The FBI confiscated the recordings from all of those cameras soon after the event... ...Nevertheless, the ongoing lack of access to most of the 85 videos in no way rules out a large plane impact. In addition, because of their low resolution, distant locations and low frame rates, it is probable that very few of the 85 cameras captured any useful footage of the event. There weren't 85 cameras, nor 85 videos in the vicinity of the Pentagon, and the FBI did not confiscate all of them. 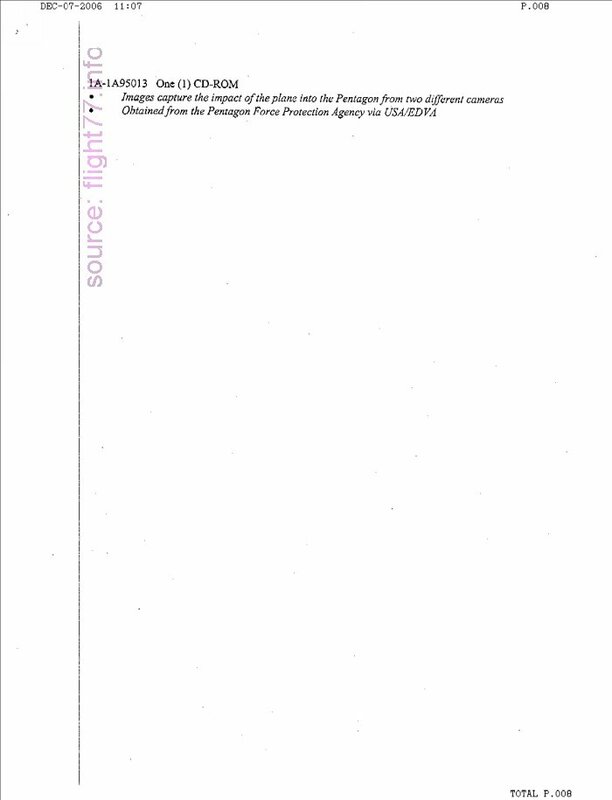 Some were voluntarily submitted by private citizens or by other agencies. If you examine the lists or menus [1 - 6] you'll see that only a few were capable of capturing a plane on impact with the Pentagon. They are the last three entries on the attached official FBI inventory (as of 2006). The lists show a total of 85 entries, depicting videos that were obtained by numerous FBI stations, including Quantico, VA, and "FBI NK"., as well as those obtained by Defense Protection Services (Pentagon) and the Pentagon Force Protection Agency. Some were from NY, NJ, WI and FL. The list includes videos filmed after 11 SEP 2001. A few were blank - no data. 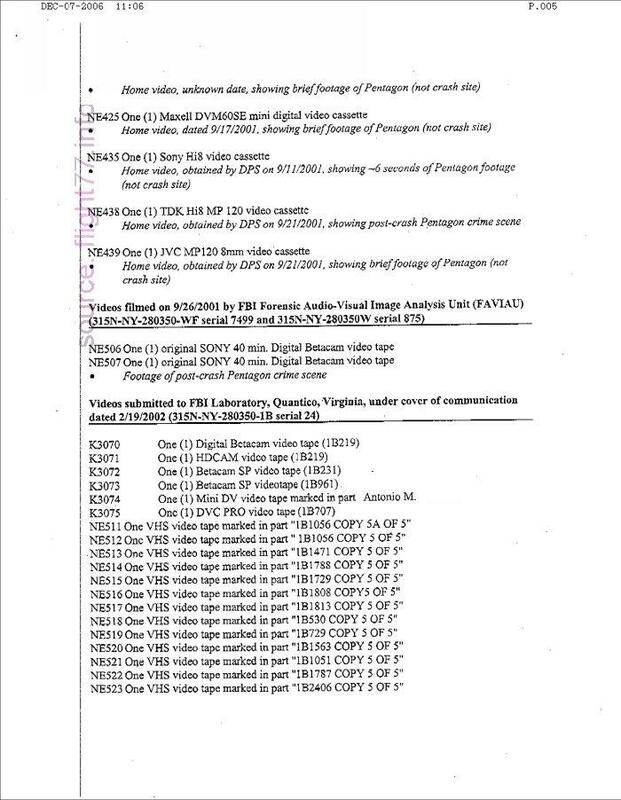 Only three entries on menu5 and menu6, (a total of four videos) came from cameras that were in a position to capture a plane arriving or impacting the Pentagon. The CITGO and Doubletree Hotel videos did not capture anything significant. Only the two parking gate camera videos (menu6) of extremely poor quality, show what is claimed to be AA77 arriving and a large fireball erupting on the Pentagon's west wall. Having made the point, there are likely more videos from other cameras, such as VDOT, Pentagon parapet, heliport fire station, and Sheraton Hotel, that deserve our serious attention. CCTV videos from inside the Pentagon might help us understand exactly what happened and when. We should stop relying on the FBI to interpret the videos. When asked for a list of Pentagon videos showing an aircraft hitting the Pentagon wall, the FBI produced a false, misleading and cryptic set of records. We should obtain access to the high quality copies and analyze them independently. The only way this will happen is through litigation. The FBI has shown, over and over, that a court order is the only way they will give up these public records. 85 Entries Menu 1, "Menu 1"
 85 Entries Menu 2, "Menu 2"
 85 Entries Menu 3, "Menu 3"
 85 Entries Menu 4, "Menu 4"
 85 Entries Menu 5, "Menu 5"
 85 Entries Menu 6, "Menu 6"
David Cole has given us interesting and valuable information about the Pentagon surveillance camera imagery in his post, but it does call for a few comments. My understanding was that the “85 cameras” questions we were addressing was from a meme within our movement that claims that “there were 85 cameras at the Pentagon”. If the number 85 refers to “entries”, and that number differs from the number of cameras, we need to clarify and document exactly HOW it differs. Also, if some of the camera footage was from out of state, then that leads to questions about the locations of other cameras as well. But the bottom line is the same, there were only 2 cameras that we know of that caught any images of value of the approaching airliner, and we have those images. Two of those camera frames show the plane. The view of the plane from one camera was largely blocked by an obstructing post, but the other camera shows the entire plane. Both images are blurry/low-resolution for reasons stated below, but when viewed with a “blink comparator” the images are clear enough to constitute quite significant evidence  . 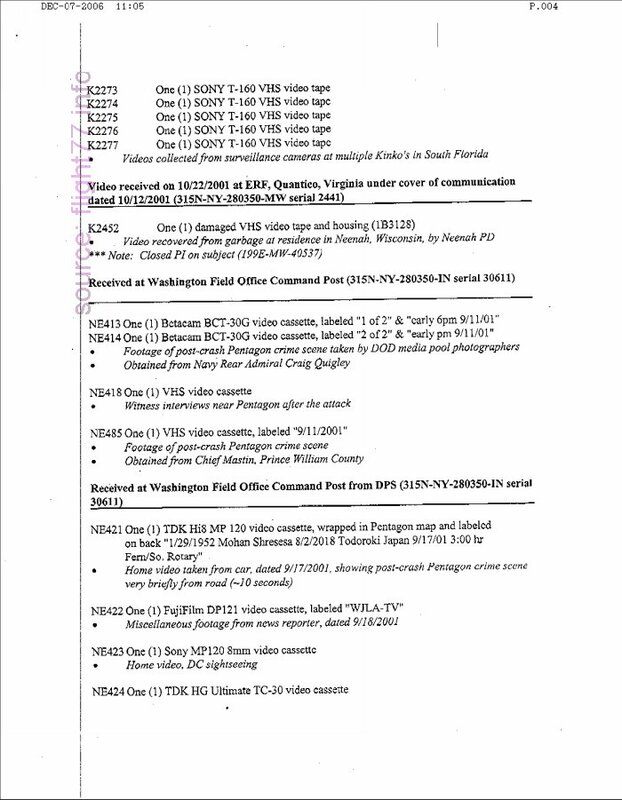 If we can obtain access to any of the other camera footage mentioned by David Cole, (assuming it still exists), for example, footage from the VDOT cameras, and/or others that were listed on Cole’s post, that might turn out to be helpful to our efforts. "the two parking gate camera videos (page F.008) of extremely poor quality"
Claiming that the quality of the images from those two cameras is “extremely poor quality” can be misleading and somewhat inaccurate, without breaking down in what way and for what reasons the quality appears poor, and without taking into account how the blink comparator technique effectively compensates for the low quality. The adjectives modifying “quality”, i.e., “extremely poor”, should be dropped, and replaced with “compromised”. The pair of surveillance cameras at the Pentagon were quite new at the time (2001), given that they were just being installed. They were good quality surveillance cameras for their time. The pair of surveillance cameras were color cameras. Many surveillance cameras at the time were only black and white. They were operating in test mode - i.e., running at only 1 frame/sec on 9/11/01. They were capable of up to 8 frames/sec. 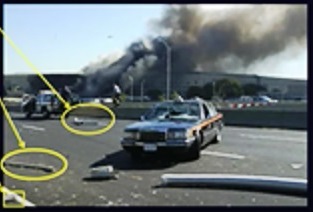 Identical cameras were in full operation at the Dulles airport, and were operating at 8 frames/second, and those cameras successfully captured video of the alleged hijackers of Flight 77 going though security, reportedly on the morning of 9/11. That footage helps establish the potential quality of the camera/recording systems at both locations. Like a majority of surveillance cameras, the lenses were quite wide angle, making objects (like the plane) far away from the cameras appear very small in the video frames. It is that wide-angle lens and the distance between the camera and the plane that is the main reason the plane appears so fuzzy, most noticeable when the part of the frame of interest is blown up so as to better see the plane. There was also motion blur of the plane’s image, due to the high speed of the aircraft (~560+ mph). The plane was largely back-lit by the Sun, which is terrible lighting for video (or any camera for that matter). Also, the Sun was in the camera’s imaging frame, which resulted in large and bright lens flares. The recorders for those cameras were recording multiplexed, compressed video data, compressed with MPEG 1, which can be quite lossy and adds compression artifacts. Many people have only seen reduced resolution, highly compressed reproductions of the actual camera frames. 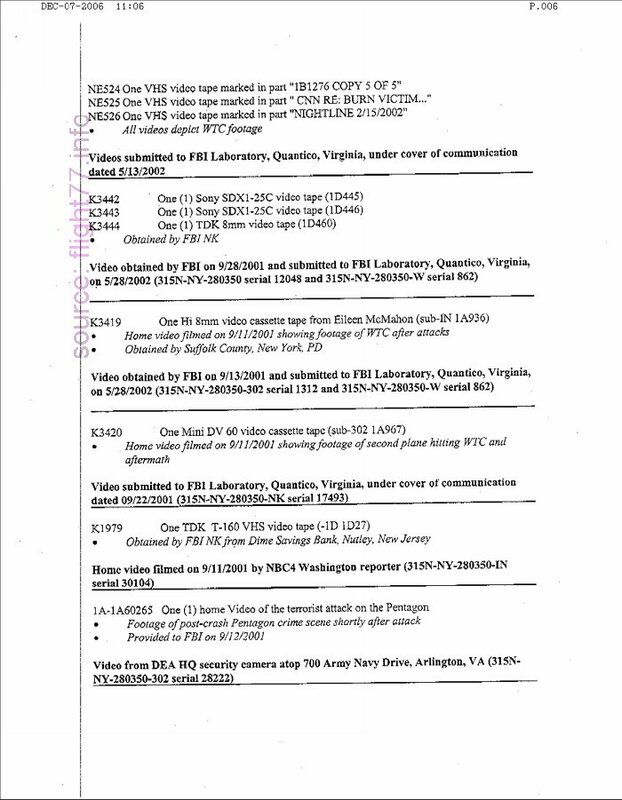 The original video frames data was released under a FOIA request, and that original data is in our hands. That full resolution imagery was used to make the blink comparator images. The 85 Pentagon Area Surveillance Cameras, "The 85 Pentagon Area Surveillance Cameras" by Ken Jenkins – 9-11TV.org. Blink Comparator Views of the Plane at the Pentagon, "Blink Comparator Views of the Plane at the Pentagon" by David Chandler, based on prior work by Ken Jenkins. In the paper The Pentagon Event: The Honegger Hypothesis Refuted the descriptions, on page 31 and in Figure F-3 of the light pole that struck Lloyde England’s taxi cab, are incorrect. Recent detailed research by Wayne Coste has shown that the large mast of light pole #1 was not, as stated in the text and figure, the pole piece that entered the taxi cab windshield. Through his analysis of a series of photographs of the pole pieces for light poles #1 and #2, Coste proves that it was the much smaller lower lamp support arm of light pole #2 that entered the windshield. Figure AppE-3 was intended to show the main landing gear of a Boeing 757-200, but shows instead a different landing gear, possibly the nose landing gear of a Boeing 757-200. The photo in this comment shows the wheel hub found in the A&E driveway alongside a main landing gear wheel of a Boeing 757-200. The match is exact. This match is discussed in full in an answer to a question on the website aerospace.org. The article is entitled "Pentagon & Boeing 757 Wheel Investigation" and the question can be found here. The wheels on the plane in Figure AppE-3 have 10 cutouts whereas the wheel found on the ground in the A&E driveway has 8, matching the main landing gear of a Boeing 757-200. The aerospace.org article by Jeff Scott and Joe Yoon dated January 21, 2007 ends with this paragraph: "This investigation indicates that the only wheel matching that found at the Pentagon is the main gear wheel of a Boeing 757-200, the same model as American Airlines Flight 77. 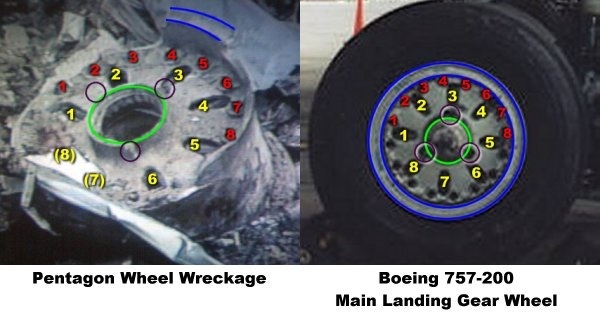 The key features of the wreckage--including the number, size, and shape of the cutouts and bolt attachments--perfectly match those found in a main landing gear wheel of a Boeing 757-200, as illustrated in the above comparison. None of the wheels of the Global Hawk, A-3, or 737 match the debris, which is not surprising since all of these aircraft weigh considerably less than the 757 and use correspondingly smaller wheels of differing design."